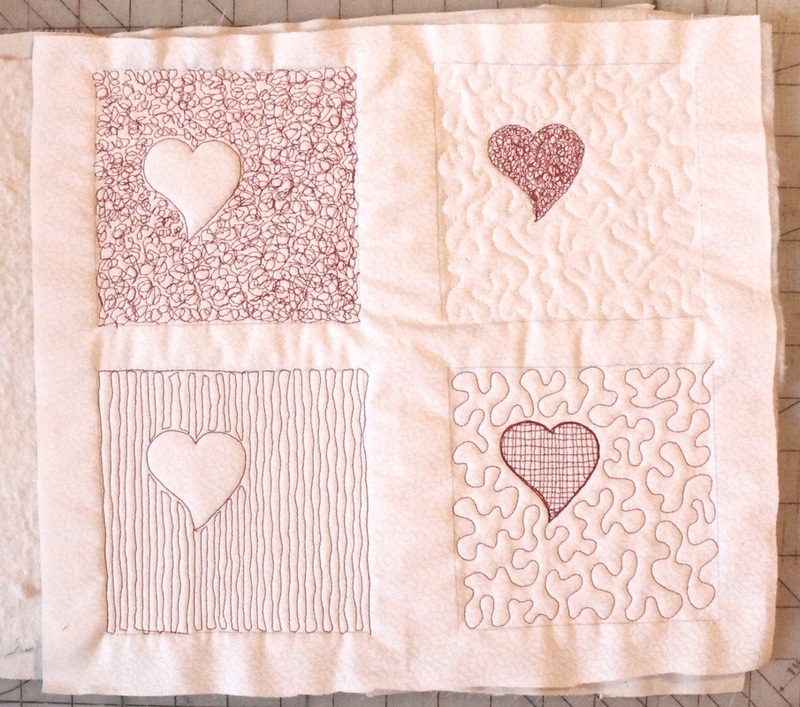 These are 4 variations of one simple design, each using free motion stitching a little differently. If you made them rectangular instead, you could make them into cards. 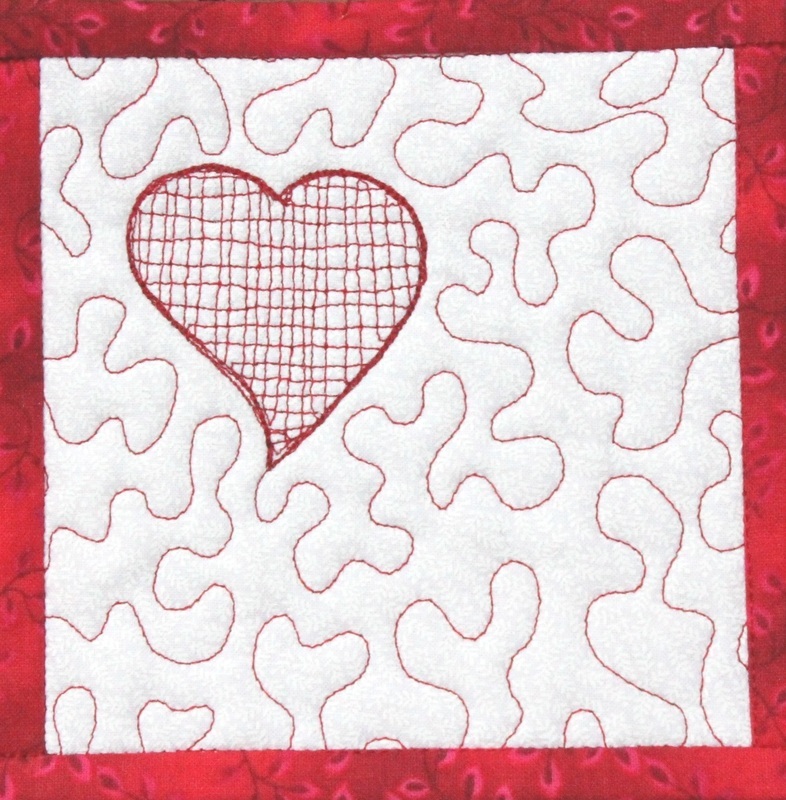 For the first one, I stitched around the outline of the heart first. I then just scribbled all over the rest of the background with my free motion stitching. It is pretty much little messy circles, purposely overlapping. Much easier than trying to make sure your stitches don't overlap! I kind of wish I had skipped tracing the heart. If you do that, you would want to use something removable to draw the line, and make sure your scribbling goes right up to the line so your heart still has definition. Another option is to trace it with thread that matches your background. For this one, I again traced the heart, then made slightly squiggly vertical lines. 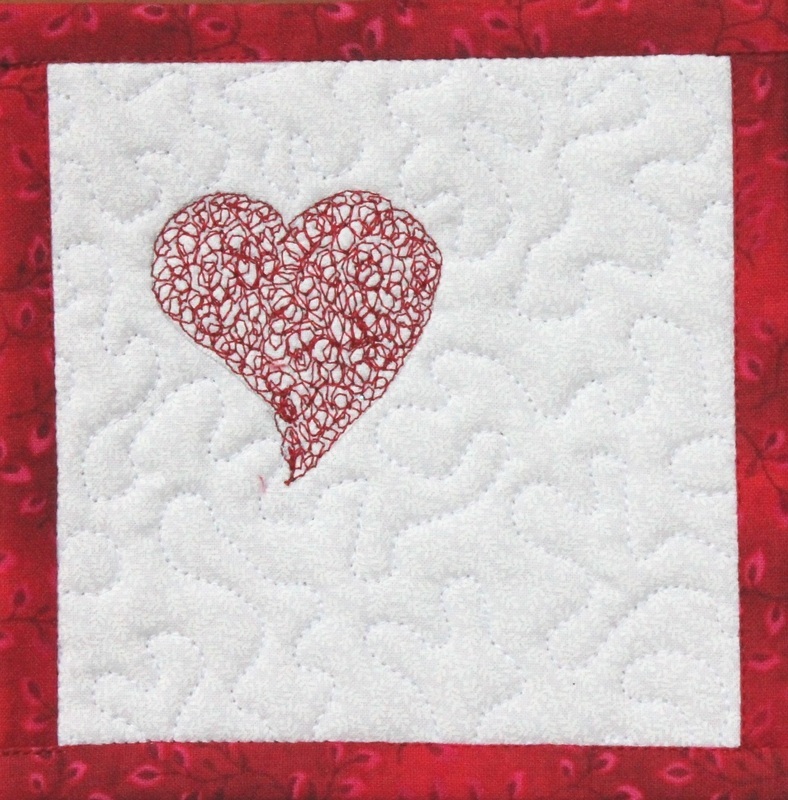 I decided I didn't like the lines around the edge of the heart, so I went around the heart several more times. Now it looks like I meant to do it that way :-) There's always a way to fix things! For this coaster, I just did the scribbling inside the heart instead of outside, then added stippling with thread that matches the background. The background is white on white, but close enough to solid that the stitching does show, but not nearly as much as contrasting thread would. The second photo shows how I started the heart. I went around the edge with little circles first, so I would still have a defined edge. Notice the thread tails...it is always good to take one stitch and pull your bobbin thread to the top before you start. After a few more stitches you can clip them off. Last one! 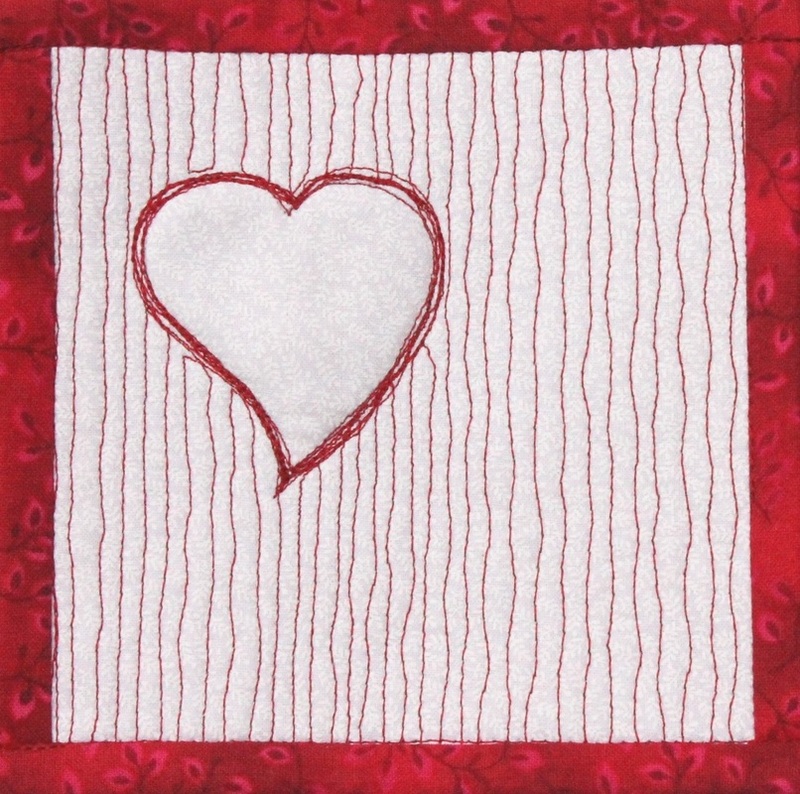 Again, I traced the heart, then made squiggly horizontal and vertical lines going across it. The outline looked messy when I got done with that, since you have to keep traveling on it to get to a new spot. So I did the trick of going around the outline several times again. Then added stippling like the previous one, only with contrasting thread. 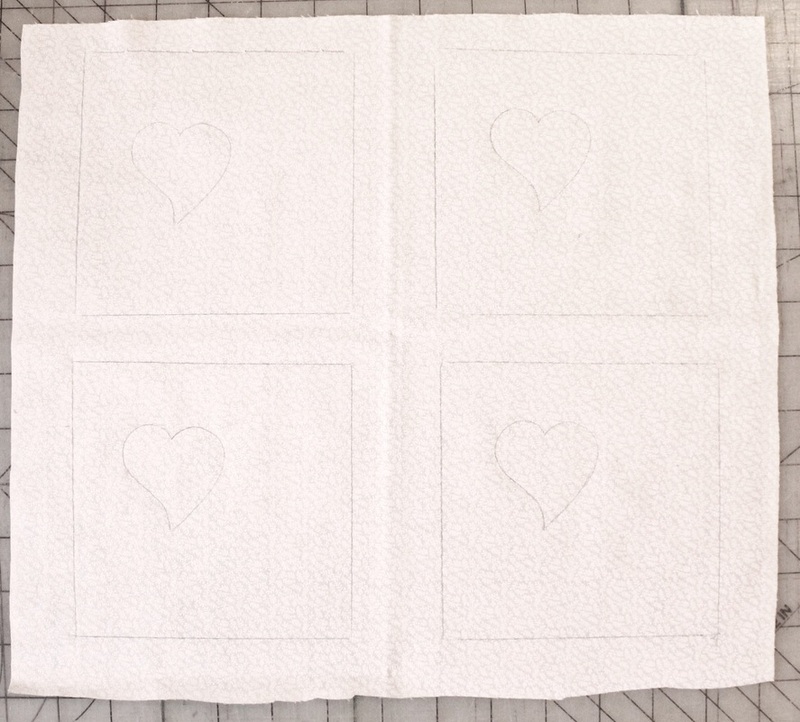 To finish your coasters, cut them out at 5 inches, which may now be slightly outside your original lines due to the stitching causing your fabric to draw up. I used straight binding, using the edge of my straight stitch foot as a seam allowance guide. To make narrower binding, just move the needle to the right and you can still use the edge of your foot. The binding should generally be cut 4 times as wide as your seam allowance. Mine was about 3/8 inch seam allowance, so 1 1/2 inch binding strips. 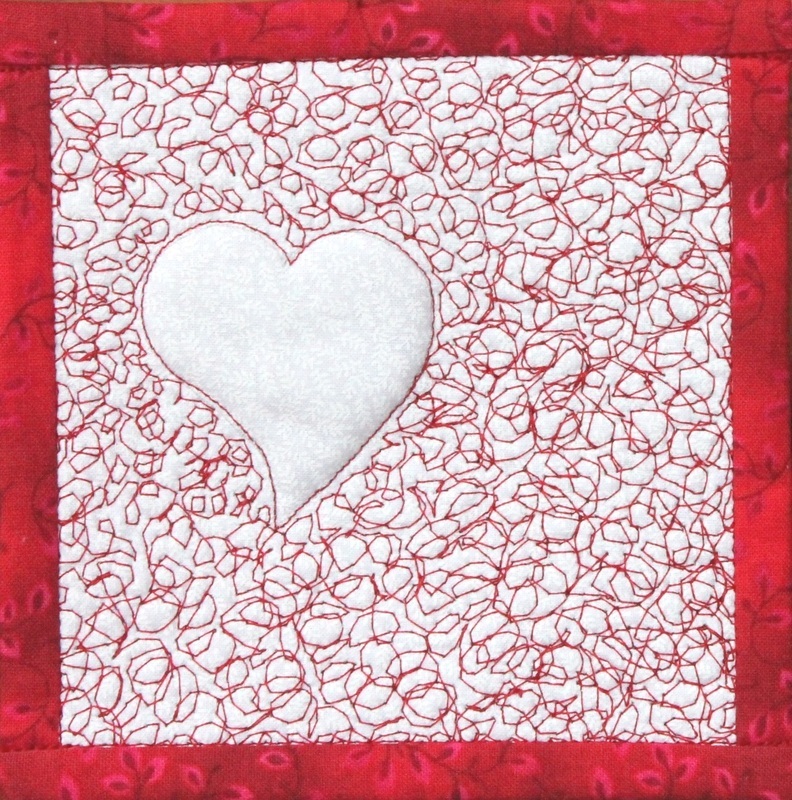 There is a nifty binding method with better directions in any of my card patterns, available for download for only $4.75. I am willing to give away lots of secrets, but I can't give them all away, right? 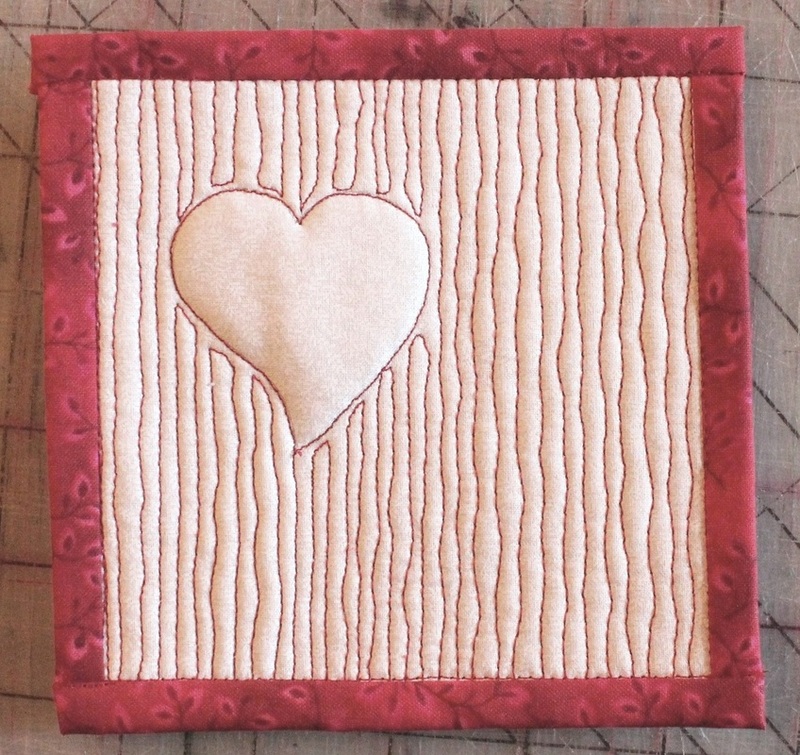 :-) You could also add another backing to cover your stitches before doing the binding if you want.